The Culinary Gadabout: Celebrating food 24/7 & 365: Is it overkill? Celebrating food 24/7 & 365: Is it overkill? While looking at online recipes this morning I stumbled onto the June 2013 calendar at Food.Com, and was instantly intrigued. Why? Because every single one of June's 30 days is given over to the celebration of a particular food, an entire category of foods, or--once in a while--a drink. For example, June 2 is Rocky Road Day, June 18 is Cherry Tart Day, June 15 is Lobster Day, and June 19 is Martini Day. Some days in June announce that the entire month celebrates other culinary/beverage delights (June is Candy Month, Soul Food Month, Seafood Month, Fresh Fruits & Vegetables Month and Turkey Lovers Month). "Wow," I thought. "June is really important for food." But then I clicked to the next month, and it was deja vu all over again. Every single day in July is given over to food celebrations such as Creative Ice Cream Flavor Day, Eat Beans Day, Caviar Day, as well as Hot Dog Month and Grilling Month. I was unclear about June 8, which is Kevin Bacon's Birthday (is it celebrating Kevin, bacon--or both?). And so it went as I glanced through the months, with every single day given over to some food or other throughout 2013 and well into 2014. August is Catfish month, and contains such highlights as Oyster Day (5th), Filet Mignon Day (13th), and Whiskey Sour Day (25th). 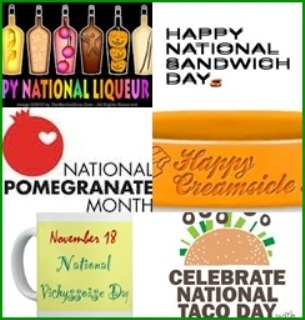 September is Honey Month, Chicken Month, Rice Month, Mushroom Month, Better Breakfast Month and Cherries Jubilee Month, during which you can also celebrate TV Dinner Day, Rum Punch Day, and many other gustatory delights. Some of the oddest days, at least to me, are November 1 (Vinegar Day), October 9 (Moldy Cheese Day), December 30 (Bicarbonate of Soda Day). A day that makes a lot of sense is January 1, which is Bloody Mary Day (good for hangovers). And a day on which you won't find any real men in the kitchen is May 20 (Quiche Lorraine Day). As for me, I'm just going to pretend that every day is December 31--Champagne Day!